Perhaps the most obvious feature of this photograph is the open nature of the 'marrams' on the clifftop. The Grand Hotel stands with the White Steps in front, enabling their guests to reach the promenade. The sunken gardens would not be laid out until after the Second Waorl War and the putting green and the bowling green in the foreground are also yet to be laid out. The photo dates from the 1920s. 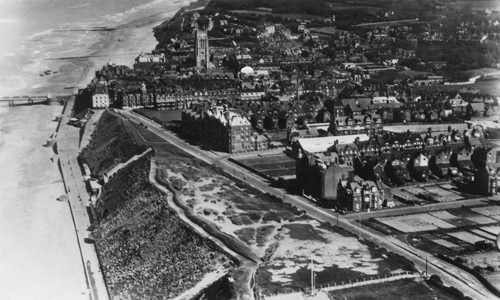 As we've mentioned on the other aerial photography pages, the book A Dictionary of Cromer and Overstrand History uses photos and drawings to try and show key developments in the town and to help you date your own pictures. On this page we've included earlier aerial photographs of the town, sometimes showing just how little has changed, sometimes showing significant change. The captions with the photos pick out some particular features but there may be many more differences that you can see. Most aerial phtography up to the Second World War is in black and white; in fact it is not until the 1960s that colour photography comes into general use. To the best of our knowledge the photos shown are out of copyright; if otherwise, please let us know.